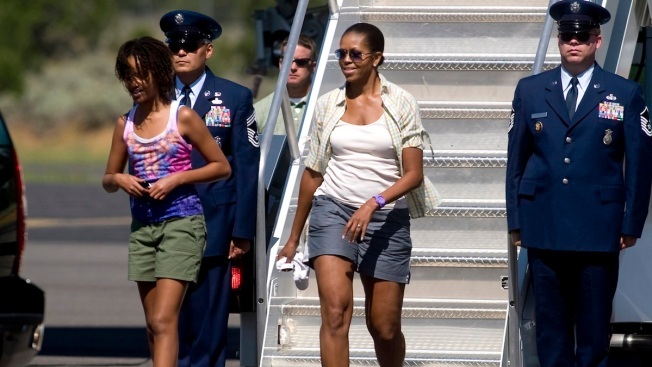 Michelle Obama Regrets Air Force One "Shorts"
This Aug. 16, 2009 file photo shows first lady Michelle Obama, wearing shorts, and daughter Malia Obama, walking off Air Force One at Grand Canyon National Park Airport in Tusayan, Ariz.
Michelle Obama says she won't wear shorts on Air Force One again because the one time she did, it created "a huge stink." Treated worldwide as a style icon, the first lady addressed the issue during a taped appearance broadcast Tuesday on BET's "106 and Park." Mrs. Obama was asked about her biggest fashion regret. She said she's always happy with her outfits but that, quote, "sometimes I forget I'm the first lady and I'm running around in shorts." She recalled her family's first White House vacation, to the Grand Canyon in August 2009. Mrs. Obama said her wearing shorts getting off the plane "created a huge stink because people were like, 'she's wearing shorts getting off of Air Force One.'" She said her thought was "we're on vacation."